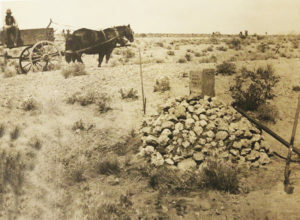 In 1901, at the western edge of the Arizona-Utah border, surveyor Howard Carpenter meticulously located the 37th parallel through astronomical observations, established the longitude from a previous survey, and constructed a square sandstone pillar marked with the names of the three conjoined states. Here American versions of Tibetan prayer flags fray in the bright dry wind. From here the 37th parallel borderland stretches east 1209 miles to Missouri, “an imaginary line… separating the imaginary rights of one [state] from the imaginary rights of the other.” (from the definition of boundary in Ambrose Bierce, The Devil’s Dictionary, 1911).